The Shirt Box of Farmington Hills and Detroit-based Don Bosco Hall has partnered to help outfit hundreds of men across metro Detroit as they return to the workforce. Donors are encouraged to bring gently worn men’s professional clothing – dress shirts, slacks, ties, sport coats, etc. – to The Shirt Box at 32500 Northwestern Highway in Farmington Hills. Donations will be given to Don Bosco Hall. In recognition of the tough economic times locally and nationally, Don Bosco Hall launched a free clothing store last year within its Community Resource Center. Serving out-of work, underemployed and homeless individuals, the store is managed by youth within Don Bosco Hall’s Male Leadership Academy. The young people in the program are learning the importance of community service by working in the clothing store. Clothes articles are donated and anyone in need can receive services at no cost. Please note: While The Shirt Box will serve as a donation drop-off point, all garments will be distributed through Don Bosco Hall’s facilities only. Don Bosco Hall works to strengthen families, offering an opportunity hub where youth and families can be exposed to a wide variety of educational, recreation, and cultural arts and skill development activities. More information about the organization can be found by visiting DonBoscoHall.org. 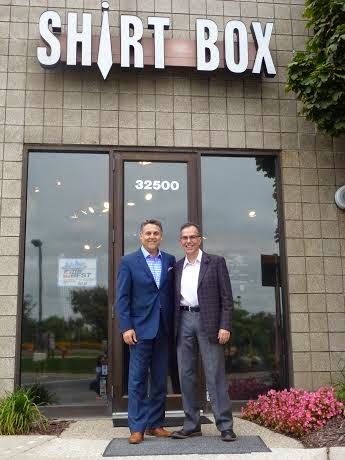 Celebrating more 33 years, The Shirt Box has been the store-of-choice for men’s fashions. Trendsetters will find an extensive merchandise assortment of men’s furnishings, corporate casual wear and business wardrobe classics. Men’s footwear, accessories and gifts round out the assortment. Visit The Shirt Box on Facebook or The Shirt Box on Twitter for more information.